courtesan with a mole on her face looked at the mirror only to discover lines on it. She was aging. In hindsight all those years of years of petty pilfering from her clients wallets, really hadn’t amounted to much. Mortgage had eaten into most of it, she told herself. She didn’t even have her own home yet, she rationalised. She decided it was time to make the most of her clients, which included the who’s who of the city’s elite. The next day she stopped picking pockets on the sly. Instead she started reminding them about all about the services she had rendered to them. Night and day. Night and day. They decided to shut her up by pooling together some monies, to buy her silence. Some of the clients were builders who pooled in money for the cause. Then there was this baker, who blends batter in public, but mixes mortar in private. Then there was a clown, who prefers donning a suit to parades and a diarrhea prone ex-bureaucrat among others. Being a public figure, the ruler of Goaput did not pitch in any money. It would be too obvious he thought. What would the people think, if they came to know of his association with a courtesan? Instead he informed the client brotherhood that he would throw in a few ads soliciting financial aid to the courtesan. The courtesan was thrilled. She had money enough to last a while now. So she stopped soliciting other customers for a while. In fact so secure was she, that she even stopped soliciting the Church. i.e. until the Church itself ended up at her door. 1) The story hasn't ended yet... it continues to unfold. You guys follow newspapers right? Should now expose Rajan for who he really is especially since whilst some public still revere this senior journo, most politicians either hate or fear this man. Else ask Churchill, Luizinho, Parrikar, Narvekar, Babush, the Ranes, Willy, not forgetting "Mummy" about the damage he has caused to them? Rajan still claims Narvekar was behind his 'brutal' assault that almost left him paralysed? Unhappy that SGJA has kept him out of the decision making executive comitte after monopolising the non-registered association, bureau chief of Tarun Bharat Sushant Kunkolienkar has opted to form his own body Dakshin Goa Marathi Sangh that will be inaugurated by Chief Minister Digambar Kamat on 17 August evening at Hotel Nanutel, Margao. can somone spill some dope on how Sushant conducted the affairs of the SGJA when he was the presidnet. It will be interesting to know how he managed to get all the funds for the various activities that he conducted when in power. Who is `Rekha' in this UmRao JaAn. Your take on these journos is absolutely true. SG is a black mailer once kicked out from TOI Calcutta, on the run from the underworld there for unethical practices, maliciously wrote on River Princess for Anil Salgaocar,duly endorsed by a badminton freak who came from the hills to wreck the BJP ship,was out of Goa only to return to poke his stinking nose once again. Sushant's latest association of Marathi journos is a result of frustration from being kept out of d SGJA that he along with his stoogies RUINED. The ToI...the Old Lady of Borybunder has already started behaving as the Spent Hag of Miramar. You Guys have a look at that unofficial upper calss folks paper too eh. Where every day is a Sunday. Penpricksbab, you got it all wrong. The real whores are the ones who elect and pamper the so called `clients'in your story. They sell their souls. The courtesan only sells her body. Reuters - Google Inc's India subsidiary is being sued for alleged defamation in the Bombay High Court by an Indian construction equipment company, The Wall Street Journal said. Mumbai-based Gremach Infrastructure Equipments & Projects Ltd is demanding that Google disclose the name of a person who criticized it using Google's blogging service, the paper said. A blogger using the name "Toxic Writer" criticized the company on blogger.com, a site that allows individuals to create blogs without publicly revealing their identities, the paper said. The Journal said the Bombay High Court ordered the blog taken down on Feb 26. "At the present stage, there is merit in the contention ... that the article put up by the defendant on the blog site is defamatory," the paper quoted the court as saying. The court ordered Google India to reveal the identity of the blogger within four weeks of the order, the paper said, adding that Google is yet to reveal the blogger's name. If Google loses the case it may have to disclose the blogger's identity, a move that could set a precedent for court challenges to the anonymity of its users, the Journal said. Google's India subsidiary could not be immediately reached for comment. I am fully convinced that you speak the truth and nothing but the truth which is hidden from the average Goan.Anonnymity is justified in the present circumstances.How I wish more of Goans knew of penpricks hitting bang on where it hurts the most? The anon who posted the Google Story...are You Rajan Narayan or Arun SInha ;-) Either ways anonymity is conditional access, if the Pricks want they can reveal. Most importantly, learn to take critiques. Often we have a very non-formidable opinion about ourselves. PP does shake us out of it. I have been affected on this blog but I love it. Reason...Sometimes we don't see where we are heading, what we are doing. 5. Station Correspondent for NDTV, CNN-IBN, Sahara Samay (the most corrupt entry into Goa Media ever), Zee News, ETV, ANI...etc etc are beyond any flaw. When are you going to end your marathon story? quit digging the old muck when u r stuk 4 a story ur last post was on 16 aug. loks lik PP has gone 2 d assmbly wid d 39 MLAs for a pc of action. A P always behaved like a stooge of Babu Naik and Shantram Kadam and never worked as a true moffussil journalist. Kadam even rewarded him with a two-wheeler. PP is doing a fantastic job. But unlike most of the Goa newspapers, please do some follow-up reports. 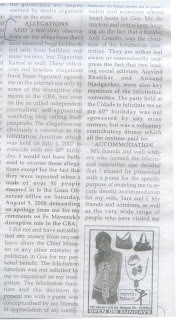 Yours readers would like to know whether TNT editor Arun Sinha has filed a police complaint against Penpricks. It's almost a month now that PP reported on the Editors' Guild meet at Marriott Hotel. Readers would want to know whether Sinha took the challenge of PP to file the complaint. As Sinha knows to play his cards well with the management, Dempos will certainly not object. They might give Sinha another hike if he does that as PP has in the past blasted Shrinivas Dempo's wife who is a Director and oversees TNT affairs. He will do anything what his management tells him to do. May be someone will have to persuade Mrs Dempo to direct Sinha to file the complaint. PP should also seek readers views on the series TNT is running on neo-Goans. Sinha is reaping harvest in Goa but he is totally anti-Goan. Remember few months after he became the editor somewhere in the first half of 90s, he wanted to recruit one guy as an assistant editor or news editor. The choice was between Marcellus D'Souza (ex-Herald) and Rajesh Singh (who under Parrikar regime became Director of Information). Thinking that Marcellus was a Goan (he is not from Goa), Sinha promptly selected Rajesh Singh. So much for Goa and Goans. I am told his current Assistant or Deputy Editor is also from Bihar. The editor is also a sadist. He uses Goan journalists to highlight on neo/non-Goans. Hopefully, the grandfinale of the series will be on Biharis. PP please do some digging and enlighten your readers.